DIRECTIONS: From St. Regis Falls, turn onto Duane Street for .8 miles. Then turn north onto the Conger Road for .9 miles. Continue straight at the y in the road in front of the Pot Hook Hill Hunting Club. The cemetery is just a bit further on your left. OR ... from Dickinson, go .3 miles east on the Church Road. Take the first right, and continue for 2.2 miles. 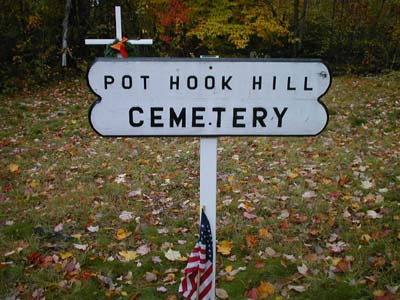 The road will come to a t, right in front of the Pot Hook Hill Hunting Club. Turn left, and the cemetery is just up the road on your left. 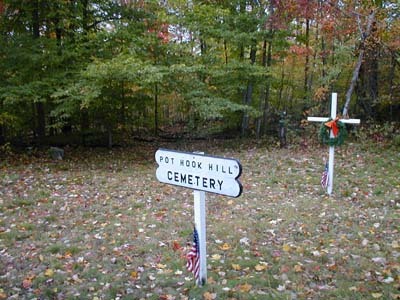 This cemetery is also known as Daggett Cemetery. It was entered by Ralph W. Bennett from a handwritten copy with no source dated August 1980. "No stones just little wooden markers - abandoned for many years and restored - no dates or names - just hear say from old timers in the area. Believe to be 27 graves in all. Stones taken years ago to make a sidewalk to a private home. Many stories regarding this cemetery, money buried here, tragic deaths, etc." "Fred HAZEN - believed to have buried a great deal of gold coin under a large tree someplace near this cemetery." If anyone can add any information to this cemetery please contact this site. "They had a son, Marlow, who never married and twin girls: Eva & _____"